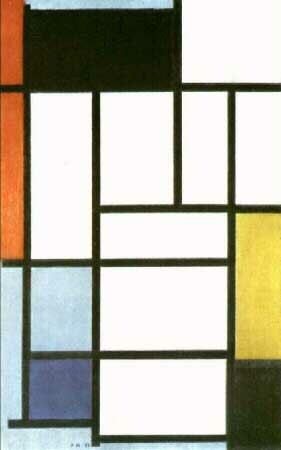 Dutch painter, creator of the neo, born in Amersfoort on March 7, 1872, named Pieter Cornelis Mondriaan; He/She was the eldest son of a Calvinist school teacher. Because of parental opposition, do not enter the school of fine arts in Amsterdam until 1892, where he/she studied until 1897. Until 1904, he/she works as a naturalist painter. From 1905, they begin to influence him more modern ideas, experimenting with the innovations of the divisive and the fauves. "His first landscapes already anticipate their typical compositions in vertical and horizontal, its emphasis on linear structure, flat pictorial defined good and above all, the fascination by the observation of a single scene or object. The first landscapes also added the principle of the frontality and, in the paintings of Mills ('mill water', 1905), the framing and enlargement of the reason. The instinct to control the abstract representation of the pictorial space appears to show with intensity from the beginning of his career"(Arnason). In 1908 he/she moved to Domburg, in Zealand, and influences it Toorop and the early works of Van Gogh and symbolism. In 1909 some exhibits at the Stedelijk Museum in Amsterdam, which are crossed out of unbalanced by conservative critics; He/She joined the Theosophical Society of the Netherlands. Theosophy helps, more afternoon, to develop his theories about art. In 1909 and 1910, he/she experimented with the pointillist technique. In 1911, after having participated, along with Braque, Picasso, Cezanne and the fauves, in the first exhibition of the Moderne Kunstkring in Amsterdam, he/she decides to move to Paris. From 1912 to 1914 it gives way to a personal abstract style. About the series of drawings sea and light of stars of 1914, Mondrian wrote "looking at the sea, the sky and stars, sought to represent its plastic function through multiple horizontal and vertical crossing." I was impressed by the grandeur of nature and tried to express expansion, rest, unit". The work of Mondrian evolves from nature, and comes to the abstraction from the landscape. Through his favourite subjects (tree, the sea, the dunes, the Church and mill), you can see its evolution from a naturalism Symbolist, through Impressionism, post-impressionism, fauvism and Cubism, to pure abstraction. Composition in blue, grey and pink (oil on canvas, 1913). Rijksmuseum Kröller-Müller (Otterlo, Netherlands). The outbreak of the war surprised in Holland and unable to return to Paris. In this period limits more colors and geometric forms, being this fundamental stage in the evolution of the neoplastic style. In 1917 with Van Doesburg and Vantongerloo founded the De Stijl group, understanding by abstraction the unification of the arts and the creation of new human values. The magazine of the group, De Stijl, Mondrian starts to publish his theories. For Mondrian, the plastic expression is synonymous with the action of shapes and colors; "We found in nature that all relationships are dominated by a simple and essential, as defined by the opposition of two extreme; the horizontal and the vertical form the right angle. This positional relationship is the most balanced of all... and contains all other relations; plastic art in reality can only be expressed by means of dynamic movements of shape and color balance; pure media is the most effective system to achieve this' (Mondrian). In 1917 it begins to use the rectangles of flat color, undefined edges, shelves in an also rectangular structure. These rectangles can float or have a specific place within the structure, sometimes touching and often overlap; This interaction provides a sense of depth to the picture (Composition in Color A, 1917). Back in Paris, in 1919, his work adopts the severe rectilinear announcing his theories; It gives up the sensation of depth since that in their previous works and between 1918 and 1919 organizes the composicones on a rectangular plot in two dimensions and in Composition (Checker Board, Bright Colors, 1919), where already has limited color to the three primary more white, grey and black. To 1921 all his work is based on intersections of bands black horizontal and vertical, on a white background, forming a plot on which occasionally add rectangles red, yellow or blue. In this severe restriction of forms is a subject capable of infinite variations, which will develop with an austere integrity for twenty years. Composition with red, yellow and blue (oil on canvas, 1921). Gemeentemuseum (the Hague, Netherlands). In 1925, the year of his rupture with of Stilj, by the introduction of the diagonal in the work of Van Doesburg, the Bauhaus of Weimar, published his essay the Neoplasticism. 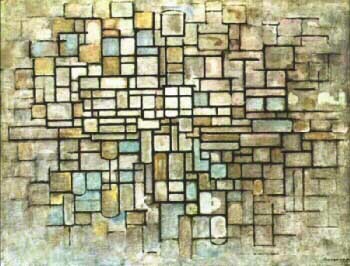 Mondrian is established as one of the leaders of modernity. The following year, Katherine S. Dreier bought one of his works. Since then Mondrian acquired the patronage of a few German, and American collectors who keep him for the rest of his life. Tableau II 1921-1925, shows the usual palette of red, blue, yellow, black and two gray ranges; the entire structure is emphatic, contains not only the color of the rectangle but it functions as a meeting point. The red and grey areas are divided into rectangles majors and minors. The black rectangles, which are a transposition of drawing lines, also act as unifying elements between line and color. Mondrian leaves the edges of the box open. Along the top and in the bottom left corner, it does not have the vertical to the edge and lines are lost in the gray; only in the bottom right that black gets to the edge, it is in fact a black area through which the lines move slightly to the left of the edge. "The picture is not flat at all. "Everything is firmly positioned, but under a great strain" (Arnason). In 1930 exposed with the Group Cercle et Carré and in 1931 adheres to the Abstraccion-creacion group; Although not involved in the Foundation of any of these movements, his presence in Paris is fundamental for the development of the abstraction. The threat of World War II forces him to move to London in 1938 (where is realciona with Hepworth and Nicholson) and New York in October 1940, where it adheres to the American abstract artists group. The skyscraper represented for him the realization of his art, and the jazz, which had always liked, affects him so far as renouncing some of its strict principles. Produced some of his most brilliant compositions, as Broadway Boogie Woogie in 1942-1943, where to get one of their highest ambitions: the dematerialized expression of a pure rhythm. "With its multitude of small color contrasts, painting seems much more impressionistic than any other previous years and suggests the nature of New York as accurately as his Cubist essays reflect the scale, morphology, and atmosphere of Paris" (Rubin). In 1942 his first individual exhibition in the gallery takes place in New York Valentine Dudensing. He/She died in new york on 1 February 1944. Arnason said of him: "was the founder of during the first world war geometric abstraction, as the ideas of 'De Stijl' and its logical developments, were an invention of his own. The influence of Mondrian was extended not only to abstract painting and sculpture, but also the forms of the international style in architecture. During the twenty and thirty in Paris, it was probably the presence and inspiration of Mondrian, which made possible the abstraction to survive and win more than of any other person, gradually force against the revolution of surrealism and neofigurativa counterrevolution, economic depression, the terror of dictatorships and war"(Arnason). ARNASON, H.H. History of Modern art, New York, Abrams, 1986.